We are all searching for a place to belong. We long to have people understand us and accept us as we are — no questions asked. When we find those people, something incredible happens: we live as if we belong. We act like people who are found instead of lost; who matter instead of let life happen to and around them. But what happens when you struggle to find a place of belonging and are constantly told that you’re an outsider? “A Philadelphia Story” is an episode that focuses on the Pearson family in their struggles to fit — with each other, and in the grander scheme of life. Randall has spent his entire life trying to find a place to fit in, and in adulthood, we still see that struggle. And in the flashbacks, we see the Pearsons struggling in the wake of Jack’s death. This episode gave us a lot (especially with that little bit of an emotional cliffhanger) to process in terms of characterization, so let’s dive right in. Understandably so, Kate and Toby didn’t want Rebecca’s negativity or stress in what is already an incredibly stressful process. Side note: Kate is beginning to notice that Toby is a bit off (he went off his antidepressants to try and help their chances of having a baby), but my bigger concern is that Kate never really considered Toby’s lack of enthusiasm about a baby. He’s not as concerned with them having a child as she is; it’s her whole world and existence right now. But because Toby is sacrificing and saying nothing, I have no doubt that this will be a point of tension for them in the future. Speaking of tension, we answer my own question from last week as to why Kate is so concerned with having a baby: she wants to have a piece of her dad back. And she makes a very bold, offensive claim to Kevin that she’s the only one who can carry on Jack’s legacy. Ouch. Wow, Kate. First of all, your wild selfishness (in both wanting to have a baby pretty much for that reason and the audacity to tell Kevin that to his face) will come back to bite you. Sooner than later, probably. Secondly: why would Kate believe that’s true? Each of the Pearson children — Randall included — has the ability to pass on Jack and carry his legacy; they each have a piece of him that they carry on. Biologically speaking, Kevin and Randall are the two who will carry on the Pearson name and legacy, not Kate. She’s married to Toby and her legacy will be the children she and he have together — to carry on Toby’s family with her. The problem is that Kate’s selfishness has blinded her to the realization that she’s hurting her husband in actions and words. How dismissive of her is it to discount the fact that Toby’s legacy matters? 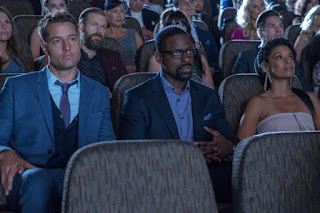 Not only does Kate dismiss Kevin, but Kevin then passes on the information to Randall — who, after spending an entire episode feeling like he doesn’t belong anywhere, feels both bitter and hurt. Honestly, I’m not a fan of Kate’s right now. Though I don’t think Rebecca’s overprotective commentary was helpful, ultimately I feel like she has valid points. Kate wants a baby because she wants a miniature version of herself and Toby — and Jack. Which is weird, to be honest, and leads me to believe that Kate’s going to become so wrapped up in this baby that everyone else (including Toby and his inevitable deterioration in mental health) is going to suffer as a result. In the flashbacks, we see Randall holding the family together. Rebecca is off in her own world, imagining Jack speaking to her (we learn later that her imagined conversation with him was actually a real conversation they had months before the fire), and she’s so exhausted with grief that she’s unable to summon the energy to course-correct Kevin (who is often drunk) or that Kate (who has begun binge-eating). Randall feels like the only sane one, but we have to know he’s suffering too. I think that’s key — Randall is used to being the port in the storm for everyone. From a young age, he was the smart kid who fixed his family. In his teenage years, he’s the one who has to tell Rebecca that her children NEED her to be physically and mentally present; she’s off in her own world of grief and has abandoned them. Because Randall is so used to fixing things and people, he’s used that to become his identity. He’s the one who is the port, and he turns down his acceptance to Howard (in spite of the fact that it’s his dream) in order to try and fix his family. There’s so much of Jack Pearson in him, but the problem is Kevin, Rebecca, and Kate especially are too wrapped up in their own blankets of grief to see that clearly. Additionally, it’s unfair that Randall adopts the role of “fixer” for his family because he’s prioritized his grief as secondary. His feelings are less important than every other member of his family. And we see the consequences of that play out in his adult life. In the present-day, Randall recognizes that Deja goes to a primarily white school. Because she mentions missing her old drill team, he decides to introduce her to a girl named Sky, who is the daughter of a woman William befriended (of course, because he’s William). The girl’s mom, Chichi, mentions the sad state of the rec center they’re in, including busted street lights, and Randall does what he does best — gets to fixing things. He drives around town to convince a councilman to clean up the rec center, and eventually changes the streetlight himself. But a funny thing happens: when Randall proudly displays his work, Chichi thanks him and then gently reminds him that the people at the rec center are not his people. They were William’s friends, because he lived and suffered with them. But Randall spent the whole day seeing problems that needed to be fixed instead of people that needed to be loved; that’s something William wouldn’t have done. William was all about relationships; Jack Pearson was all about going the extra mile. Randall Pearson is an interesting combination of both of his fathers — but he doesn’t fit into either William or Jack’s shoes. So he feels, naturally, lost. Randall is such a complex and interesting character, but I love that Chichi pointed out Randall’s tendency to try and be the “fixer” rather than the person who sits and listens and just exists. Randall’s role has always been that of the port in the storm. He keeps everyone together, and his value (he believes) is tied to what he can do or provide for others. The sad thing is that based on his life experience, I don’t think Randall believes he’s enough for anyone, just as he is. He keeps trying to fit into everyone’s molds and when he doesn’t, becomes naturally discouraged. Later on, he tells Beth that he can’t win: either he’s not trying hard enough, or trying too much. The one place Randall thought was safe — his own family — is not even safe anymore, because he learns what Kate said to Kevin. And “A Philadelphia Story” ends with Randall feeling betrayed by his own sibling. For a man who never seems to belong and yet tries to be everything for everyone else so that he can find purpose and community and love, this is truly a devastating blow. Kevin and Zoe are super adorable still, and we see at the end of the episode that Zoe is willing to let Kevin in instead of push him away. It’s a small step, but you can tell Kevin thinks it means the world. Additionally, Kevin’s movie premieres! He’s so concerned about being taken seriously (and we get some wonderful flashbacks of teenage Kevin on the football field and in the auditorium) because he believes Jack was the only person who ever saw that potential in him; that’s why Kevin believes Jack was tougher on him than the others. He wanted to push him to his full potential — to be more than he thought he could be. It’s a beautiful little insight into Kevin’s character that almost gets lost in an episode focused on Kate’s drama and Randall’s story, but I think it’s worth noting how beautiful this was and important it’ll be for the future. I will say, I give points to Toby for standing up to Rebecca (even though we all know he is going through withdrawals and that was the catalyst). Where’s my GIF of Randall shouting: “CELEBRATORY FRO-YOOOOOOOOO”? I tweeted about this, but This Is Us is often so painful because the conversations feel too real. All the family drama is like watching our own families reflected back at us. What did you think of this week’s episode? Sound off in the comments below!